I recently had to re-download Firefox1. Now I’m a little slow. Mozilla is “reinventing itself.” Got it. 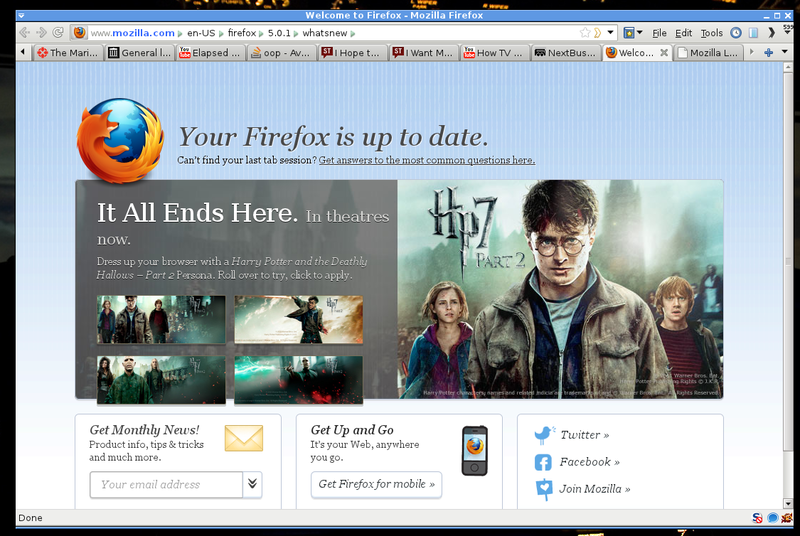 But can someone help me understand what a half-page about the new Harry Potter movie has to do with Mozilla’s Mission2? 1 I put myself on the beta channel some time ago; I wanted to help test security fixes before they were rolled out to users; but with the new and improved versioning scheme, that’s not what “beta channel” means anymore. Dumbledore won’t know. He never knows anything. Maybe ask Hermione? She’s pretty booksmart. It’s all about the money. You should know that by now. What it means it that the people how were supposed to be setting up a website to say what was new in Firefox 5 were off watching the new Harry Potter movie instead. Firefox 5 has a new Dementors Manager ? I’m confused. Did you switch from Beta to Aurora (because you wanted to test security fixes even earlier) or from Beta to Release (because you didn’t want to test things other than security fixes)? The mission involves getting as many people using Firefox as possible. Currently most of human civilization is enjoying Harry Potter. In related news, Chrome is being endorsed by Justin Bieber. You could say that the beta channel arguably still is about testing security fixes before they are released to users since each new version ends up being the security update for the previous one. I guess he means he was using beta to test security fixes earlier. But since beta means new features as well nowadays, he gave up on that and decided to just go for the release versions. Never liked the advertisements on the release page, I guess a potter fan would disagree. They should have just put Harry Potter in the browser itself. Let http://brandthunder.com take care of that. The connection’s obvious, really. The Open Web is programmed by nerds. Lots of nerds love Harry Potter. Seriously, though, give the nerds at Mozilla too much power over that page, and they’re going to use it to squee over HP Personas. That’s how humans work. They’re trying to draw people’s attention to features they don’t know about (Personas) by harnessing a very popular book/movie franchise. What good are core features if users don’t know about them? @Jesse: I moved to the release channel; I originally moved to the beta channel because I wanted to test security fixes to the stable version to help provide feedback. I’m not interested in testing new features and having a constantly-broken extension experience. @Alex: So… Chrome is endorsed by Justin Beiber. And? Is your argument really “Mozilla is just doing exactly what Google is doing; we’re just like them”? Also, I’m not sure I buy your restatement of Mozilla’s mission; certainly, “getting as many people using Firefox as possible” is part of the mission, but how that’s done is at least as important as the goal. Item 8 of the manifesto supports this. @Everyone else saying “Harry Potter is popular right now”: lots of things are popular; why don’t they get their Personas advertised? And is the implication that no money exchanged hands for placement of these ads? I find that claim hard to believe. Hey there — just wanted to let you know that we’ve actually worked on many other promotions in the past with Personas (Lady Gaga, the previous Harry Potter movie, Greenpeace and many more) and also with Add-ons (eBay, Joga, Nike, Stumble Upon to name but a few). We have a very large Firefox audience these days, and its very engaging for users to have access to great causes / movies / people and other things they love within their browser. I’ll be at the Community Marketing Call this Wednesday if you’d like to chat more. Is there a way for community members who might want to promote their own personas and addons on the landing pages work with Mozilla to do that (assuming, of course, some level of usage, etc. ; I’m thinking things like NoScript/Adblock, etc. )?